BRASILIA, Brazil, October 7, 2015 (ENS) – The environmental group Greenpeace today delivered a bill banning all deforestation in Brazil to members of the Brazilian National Congress. Since the draft legislation began circulating in the country in 2012, it has been signed by more than 1.4 million Brazilians. The popular initiative was received in the green room of the Chamber of Deputies by elected representatives who care about saving Brazil’s Amazon rainforest. 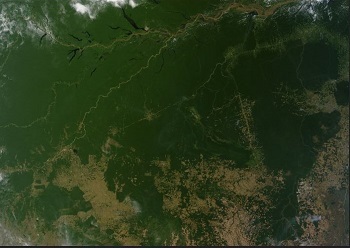 An estimated 20 percent of more than 1.5 million square miles of rainforest has been cleared to date. Much of the land has been used to graze cattle and grow soybeans, Brazil’s two largest exports. Deforestation and forest degradation across the Brazilian Amazon are estimated to emit 200 million tonnes of greenhouse gases into the atmosphere each year. For Congressman Ivan Valente, a member of the Socialism and Freedom Party representing the state of São Paulo, the legislation forbidding further deforestation makes sense. “This project is easy to process, are just a few articles, and we can have a spectacular gain. Brazil can still be champion of biodiversity, “said Valente. Greenpeace strategic coordinator Paulo Adario said that the movement wants to establish a viable law, with five articles: the first prohibits the deforestation of native forests throughout the country. There would be exceptions for indigenous and Quilombola communities and, finally, the bill repeals all laws to the contrary. “What has been proven is that there is more need to clear to produce. Since 2006 [people] can’t buy [a] deforested area, [yet] soy and soy in the Amazon [has] tripled without new deforestation, the same happens with the cattle,” Adario said. 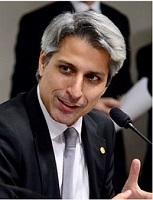 According to Deputy Alessandro Molon, who represents network Rio de Janeiro, if there is agreement among congressional leaders, the bill could come to a vote before the UN Climate Conference, COP21, which will be held November 30 to December 11 in Paris. There, world leaders are expected to signed a global, legally-binding climate treaty to rein in greenhouse gas emissions. Meanwhile, in Brazil’s largest city, Sao Paulo, the World Business Council for Sustainable Development and its Brazilian counterpart, CEBDS, today launched what they are calling “climate smart” forest management, agriculture and land use programs for Brazil. Business executives and Brazilian policymakers met in Sao Paulo to drive low carbon technology solutions forward in advance of COP21 in Paris this December. The dialogue is part of a series of national dialogues taking place across the world from September to November within the context of the WBCSD’s Low Carbon Technology Partnerships initiative. “Together, the Climate Smart Agriculture Program partners are working on commitments to be reached by 2030 and 2050, respectively, which will allow agriculture mitigate and adapt to the effects of climate change and improve harvests and incomes for farmers.” Bakker said. 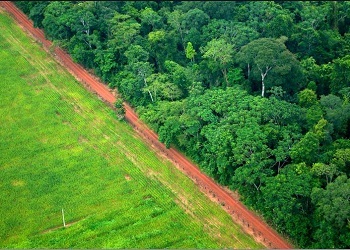 Constrasting adjacent forest and agricultural landscapes near Rio Branco, Acre, Brazil. (Photo by Kate Evans for Center for International Forestry Research, CIFOR). Agriculture and other land uses are estimated to cause about 25 percent of the greenhouse gas emissions from human activities such as deforestation and forest degradation as well as emissions from livestock, soil and nutrient management. The trick will be to feed the growing world population, expected to top nine billion by 2050, while restraining planetary warming. One example of how this might work is biotech giant Monsanto’s partnership with Conservation International in Brazil to promote a larger effort to prevent illegal deforestation, conserve agriculture resources, and safeguard biodiversity. Working with farmers, seed gatherers and local government, Conservation International and Monsanto have restored about 10,000 hectares of native forest, critical to water sources.